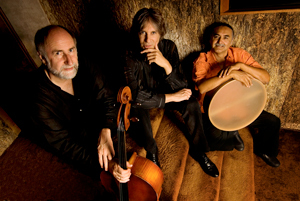 On Friday, September 20, as part of the KeyBank Friday’s @ 7 series at Severance Hall, Eugene Friesen will be joined by Trio Globo colleagues Howard Levy and Glen Velez for an after-party performance of contemporary music that is rooted in jazz, classical, sacred music and global rhythms. The evening begins at 6:00 pm in Reinberger Chamber Music Hall with a pre-concert performance by pianist Gregory Wang with special guest Peter Takács. At 7:00, Fabio Luisi will lead The Cleveland Orchestra in performances of Schumann’s Spring Symphony and Beethoven’s Piano Concerto #5 (Emperor) featuring Hélène Grimaud. “We really do come from very different musical backgrounds,” Friesen says of his Trio Globo colleagues, “but when I get together with Howard and Glenn I just feel this extraordinary loving respect that goes across our traditions and our various approaches.” Pianist and harmonica player Howard Levyhas worked with Bela Fleck and the Flecktones, Kenny Loggins and Paquito d’Rivera. and percussionistGlen Velez, in addition to being the “founding father” of the modern frame drum movement, has collaborated with the Paul Winter Consort, Steve Reich, Maya Beiser and Pat Metheny as well as numerous symphony orchestras. And Friesen has had his own long association with the Paul Winter Consort. Because Winter’s music is largely based in improvisation, a craft not often associated with classical music, did he have any problems fitting into the group? “I think I had an instinct for free improvising. Some of my background in contemporary music and kind of exploring different sounds on the instrument opened up some possibilities, so I could play it abstractly. But what’s been more difficult has been learning to play by ear over more sophisticated harmonics. So that has been my work in recent years.” But he quickly says that as a teacher he has enjoyed working with classically trained musicians — as he puts it, “to play from the heart instead of from sheet music and to illuminate the pathway into becoming more proficient in improvising in a lot of different contexts. Eugene Friesen offers his thoughts on the state of classical music in a blog post from March 25 of this year. The post is reprinted with the permission of the author. I’m hearing of more and more unusual contexts for classical music: Beethoven’s “Ode to Joy” in a town square flash mob, chamber music in bars, solo Bach electrified in a rock club. Bringing the music to the people is not a new idea, but it’s being pursued with a passion all over. And it’s refreshing to see so many musicians willing to make a break with tradition, to take themselves a bit less seriously, and let their favorite music speak for itself on Main Street. I think this is creativity — it may be creativity in its early stages, but it’s creativity nonetheless. For way too long, musicians have furthered the notion that the great composers are deities. We forget that these guys were musicians, they had sometimes vicious and raunchy senses of humor, untidy abodes, work stations and personal lives, and really had to figure out how to make money. In addition, they chose a creative vocation that is rife with failure. It’s easy to look at a Schubert song and believe that this came into musical life without effort or strain. Inspired, yes, but also crafted with an eye on the public and an ear to the publisher. And the pathway to a work of art is strewn with all matter of personal and artistic roadblocks that must be overcome. It’s a messy business, creativity. And we performers need to get messy too. I believe there will always be great symphony orchestras, but it’s not obvious that there will be. Just as Mozart, Haydn, and nearly every great composer you can think of created music with roots in folk music, we are in desperate need of more Gershwins and Bernsteins to create new, exciting and emotionally satisfying orchestral music that everyone understands intrinsically. Rock violinist Mark Wood has made the point that musical innovations of the last fifty years did not happen in academia, but in pop music. So too, the institutions – universities, symphony orchestras, etc. – will most likely not be the sources of innovation and cultural change in musical performance. That will happen through a thoroughly messy – and potentially joyful – process of trial and error. In the meantime I will enjoy every Bach suite played as a fiddle tune. It’ll be great to hear a Joshua Bell in the subway, a Mozart Divertimento outdoors at sunrise, a flute solo in a reverberant lobby. These are the sounds of a culture changing.